MODERN CARRIAGES owned by the International Sleeping Car Company, and built in 1930. The company was formed in Brussels in 1876. The total rolling-stock of the company at the end of 1934 was 1,134 sleeping cars, 714 dining cars, 19 saloon coaches, 167 Pullman cars, and 157 brake vans. THE vast extent of the United States of America is responsible for the great development of its railway system, which comprises nearly 263,000 miles, approximately the railway mileage of Europe. The journey across the North American continent from New York to San Francisco takes several days and nights, and it is not surprising that the question of sleeping accommodation occupied the attention of American railway companies at an early date. Towards the end of the ‘sixties of last century a Belgian engineer, George Nagelmaekers, in the course of a protracted tour in America, learnt to appreciate the advantages of sleeping cars. On his return to Europe he set about introducing such cars on the Continent. His task was not an easy one, mainly because of frontier complications. The various railways operating in the different countries had political and economic interests which often clashed. M. Nagelmaekers had succeeded, however, in coming to an arrangement with the Belgian and with some of the French and German railways when the Franco-Prussian War of 1870-71 brought all his efforts to an end. At the end of the Franco-Prussian War M. Nagelmaekers took the matter up again and obtained a concession from various interested Governments to run a sleeping-car service between Ostend and Brindisi, mainly for the benefit of British travellers. In those days the British mail was carried overland to Brindisi, where P & O boats called in connexion with the mail service to India. A considerable saving of time was effected by this overland route, which in those days went via the Brenner. On the opening of the Mont Cenis Tunnel in 1872 the overland mail was diverted to the shorter route, and the rolling-stock ordered was utilized for another concession which had meanwhile been obtained, namely, from Paris to Vienna. IN THE ORIENT. 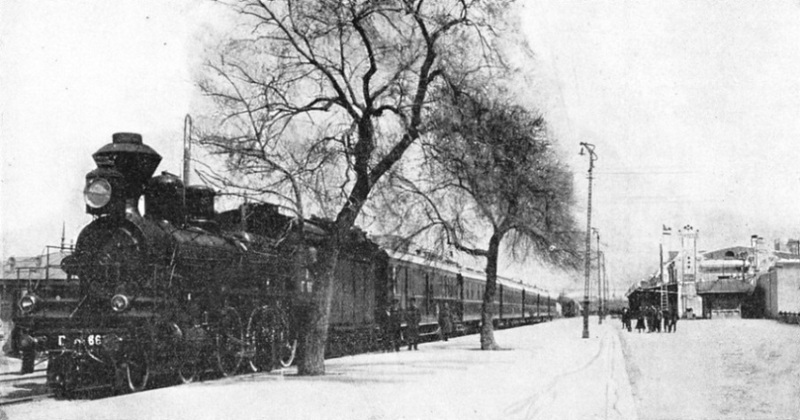 A luxury train containing sleeping cars at the station of Harbin, in the State of Manchukuo. At Harbin the company possesses repair shops for its rolling-stock. In 1873 M. Nagelmaekers formed a company with a capital of five hundred thousand francs (£20,000 gold). This company was soon afterwards absorbed by “Mann’s Railway Sleeping Carriage Company”, of which Colonel Mann was the head and in which M. Nagelmaekers took a prominent part. New contracts with railway companies were made for exclusive concessions over periods from three to twenty years, and as many as twenty-one railway companies on the Continent became interested. 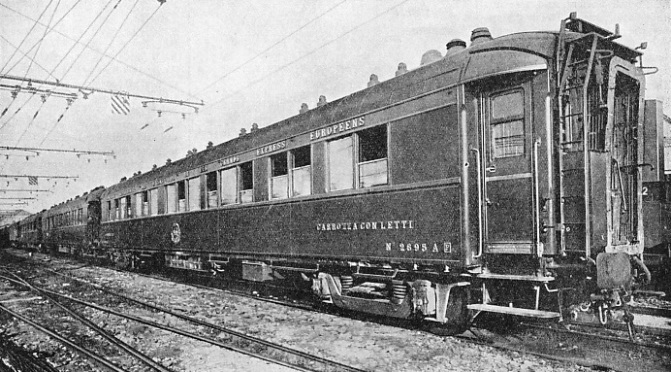 On December 4, 1876, the Compagnie Internationale des Wagons-Lits (International Sleeping Car Company) was constituted in Brussels with a capital of four million francs (£160,000 gold). The Mann Railway Sleeping Carriage Company went into liquidation, its rolling-stock and assets being taken over by the new Belgian company, of which M. Nagelmaekers became the leading spirit. King Leopold II headed the list of subscribers to the new company. Rolling-stock consisted of fifty-eight coaches. The first service of the new company was run from Paris to Mentone, on the French Riviera, and was an immediate success. The next step was the introduction of dining cars. Here also success was instantaneous, and the company decided to combine the comforts of sleeping cars and dining cars in one special train. EXPRESS ROUTES over which sleeping cars are run are indicated above. The Rome Express, with all its sections, covers a total of 1,138 miles; the Vienna-Riviera, 806 miles; the Calais-Karlovy Vary, 1,053 miles; the Riviera, 1,451 miles; the Sud, 1,320 miles; the Calais-Mediterranean, 902 miles; the Nord, 3,530 miles; the Oberland and Engadine, 1,039 miles; and the P & O, 732 miles. On June 5, 1883, the first international luxury train started on its historic journey from Paris to Vienna and Constantinople (Istanbul), then the capital of the Turkish Empire. The journey time was reduced by thirty hours and constituted a record for speed in those days. The train was called the “Orient Express”, and carried the mail. Shortly afterwards the company changed its name to Compagnie Internationale des Wagons-Lits et des Grands Express Europeens (International Company of Sleeping Cars and Great European Expresses). 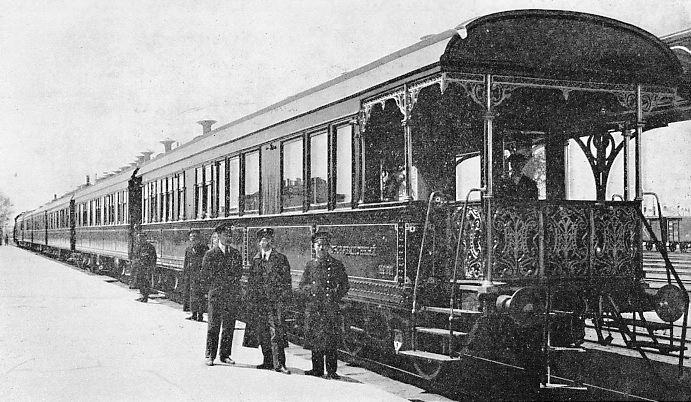 Six months after the inauguration of the “Orient Express” the “Calais-Nice-Rome Express” was put in service. At first it ran once a week, but its success was such that the service was increased to three times a week. The projected “Nord-Sud Express” from St. Petersburg (now Leningrad) via Berlin and Paris to Lisbon had to be abandoned because of the cholera epidemic of 1884-86 in France, Italy, Spain, and Austria. It was not till 1887 that it became possible to inaugurate the service from Paris to Madrid and Lisbon. THE VAST MILEAGE covered by the service of the sleeping-car organization can be judged by the above map. The aggregate mileage covered by international luxury trains, excluding that of national expresses, is 24,830. The great success of the sleeping and dining car services caused a change in the attitude of the railway companies. Con-cessions were now granted over long periods up to thirty years. 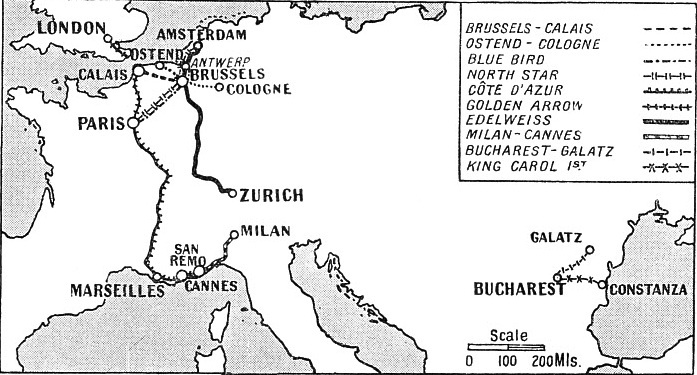 In 1894 the Ostend-Vienna route was opened; it was extended in the following year to Constantinople. The “Nord Express”, from St. Petersburg to Paris, followed in 1896; then came the “Nord-Sud Brenner Express” from Berlin to Rome and Naples via Munich and the Brenner. Twenty-five years after its constitution the International Sleeping Car Company’s cars attached to the regular last trains were to be found on most railways on the Continent, and its luxury trains were a regular feature on all main lines. In 1901 the company extended its operations for the first time beyond Europe. The “Trans-Siberian Express”, from Moscow to Irkutsk - later extended to Vladivostok - was run for the first time. Europe and Asia were traversed in ten days. In the same year the Alexandria-Cairo-Luxor luxury train was put into service, soon followed by sleeping and dining cars in Tunis and Algiers. Year by year new services on many continental railway systems and new luxury trains were instituted, such as the “Amsterdam-Riviera Express”, the “Engadine Express” from Calais to Coire, and the “Karlsbad Express”. Immediately after the completion of the Simplon Tunnel in 1906 the “Simplon Express” was run from Paris to Milan, and in the same year the “Manchurian Express”, from Harbin to Chang Choun. In the following year the “Lloyd Express” from Hamburg to Genoa, was run in connexion with the fast steamers of the North German Lloyd to the Far East. At the outbreak of the war of 1914-18 the Company had thirty-two luxury trains in service, which covered a mileage of 35,003. The war naturally interfered with the international services, though national services such as those of France and Italy were maintained, notwithstanding the fact that all the lines were taxed to their utmost capacity by military necessities. It was in one of the company’s dining-cars that the Armistice of November 11, 1918, was signed. This car had been attached to the train of Marshal Foch, and the train had been shunted during the night on a siding at Rethondes, near the station of Compiegne. The car, which bears the number 2419, is now preserved at Rethondes siding. Immediately after the Armistice some of the principal services of the company were reorganized. Railway travel on the Continent in the first year or two after the Armistice was in many parts of Europe nothing less than an adventure. The rolling-stock of the Central European States was in a deplorable condition. Thousands of first- and second-class coaches had been stripped of their velvet and tapestry coverings. Metal fittings had been broken off and had been sold for the value of the metal, wooden seats and underframes had been chopped off and carried away as firewood. None of those who had to travel in those days will forget how valuable were the services of the International Sleeping Car Company in those times of chaos and anarchy, and how admirably the services worked in the circumstances. 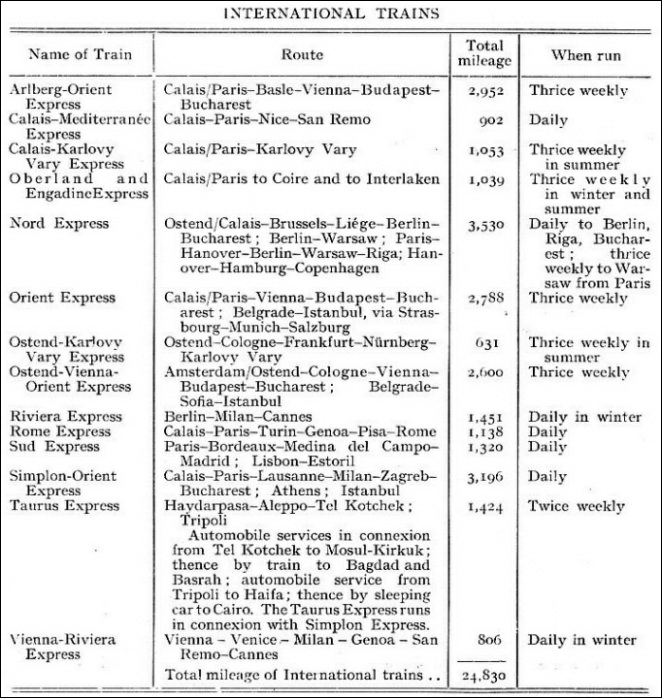 The first luxury train to be reinstated after the Armistice was the “Paris-Rome Express”, followed by the “Orient Express” and the “P & O Express”, both being run over new routes. The map of Europe had been redrawn in accordance with the Peace Treaties of Versailles, St. Germain, Trianon, and Neuilly. New frontiers had been fixed, and new states arose out of the ruins of shattered empires. The political and economic conditions of Europe demanded the immediate reinstatement of an international railway service which would stand above the strife of parties and above individual interests and national jealousies. Its international character would enable it to act as a neutral, unbiased, and unprejudiced link between the nations. This task was entrusted to the International Sleeping Car Company, which thus achieved a great moral triumph. An international Commission was formed between several of the interested European Governments, ex-belligerents and ex-neutrals on one side, and the company on the other side, for the purpose of establishing a new international train, the new “Simplon Express”. To-day the “Simplon-Orient Express”, in its present form, is perhaps the most extraordinary international train in existence. It forms a vital link between the west and east of Europe and beyond. 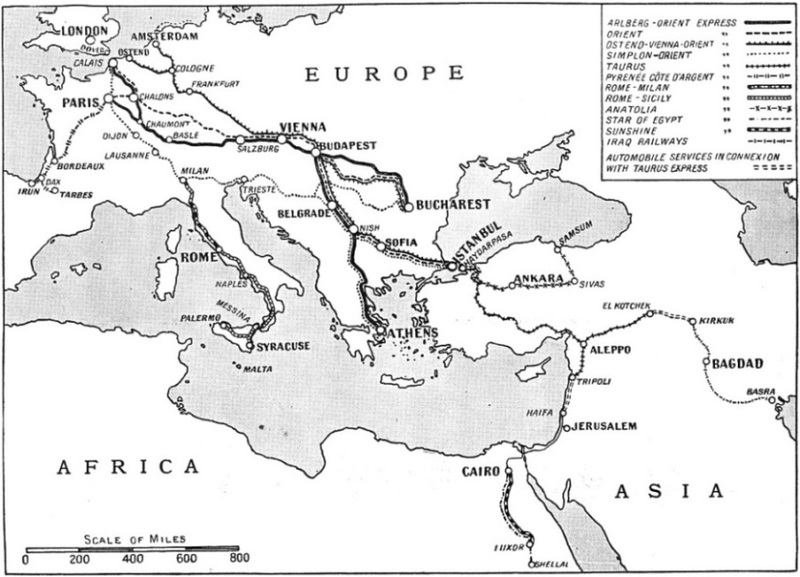 It connects Europe with Africa and Asia - along the route to India followed by the armies of Alexander the Great. With its subsidiaries it covers France, Belgium, Germany, Switzerland, Czechoslovakia, Austria, Hungary, Poland, Yugoslavia, Bulgaria, Romania, Greece, Turkey, Syria, Egypt, Iraq, and Iran. Except for two short tracts in the East, it spreads from Calais to Basrah on the Persian Gulf. SERVICES FROM CALAIS TO THE EAST are run by the International Sleeping Car Company. The Simplon-Taurus Express, running twice weekly, with all its connexions, covers 1,424 miles. The “Simplon-Orient Express” forms, together with the “Orient” and “Arlberg-Orient” Expresses and the “Nord Express”, the main communication between west and east. The “Simplon-Orient” connects the southern, the “Orient” and “Arlberg-Orient” the central, and the “Nord Express” the northern states of Europe. All these trains are in direct connexion with London via Calais or Ostend. Reference to the maps will show that their main direction is from west to east. Another group of trains forms the connexion between north and south and comprises the “Calais-Paris-Rome Express”, the “Calais-Mediterranee Express”, and the “Sud Express”. Other north-south trains such as the “Berlin-Riviera” and “Vienna-Riviera” Expresses are run only during the winter season. Besides these two main groups the company maintains a number of daily trains of a national character and a number of seasonal trains, such as the “Karlovy Vary (Karlsbad) Express” or the “Luxor Express”. A complete list of all the trains run by the company in 1935 is given in tables on various pages of this chapter. The tables show the three categories of the company’s trains, the international trains, the national trains, and the Pullman trains. Besides these trains, the company runs 184 sleeping and 314 dining car services on the Continent, Africa and Asia. 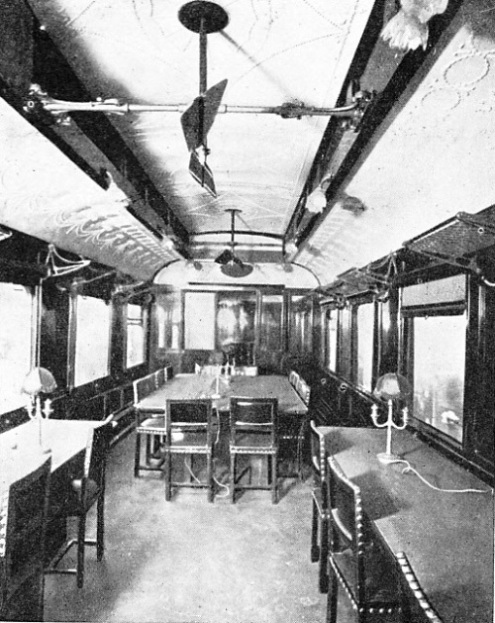 THE INTERIOR of the historic coach in which the Armistice was signed. This car was attached to the train of Marshal Foch. The organization of these services is no easy task and requires, in the first instance, a large rolling-stock not only on service but also in reserve, as all the cars have to be withdrawn periodically from service for inspection and repairs. Another important point is that each sleeping car and each dining or buffet car must be utilized to the full. To each trip there must correspond a return trip. The matter is much easier with sleeping than with restaurant cars. Sleeping cars are used only over long journeys and, as the railway companies arrange their time tables for the convenience of travellers, it is clear that the down and up services will normally balance between, say, Paris and Marseilles or between Rome and Milan. The position changes, however, with restaurant cars. A dining car travelling during luncheon hours from A to B will have to be utilized for dinner service from B to A; or it may be retained as far as C over tea-time, and then attached to a train from C to B and A. On other occasions a dining car may remain attached to the same train for the whole day from the time the train leaves early in the morning until late at night. In all these arrangements the individual habits of the travellers in the different countries have to be studied. It would be impossible to give here a complete list of all the dining and sleeping car services run by the company. Such a list would fill many pages. The time-table of the International Sleeping Car Company contains all its services in all parts of the world. The only Continental countries where it does not run any services are Sweden, Norway, and Russia, where the railways run sleeping and dining car services in the same way as the British railways. PULLMAN TRAINS operating daily in Europe are shown on the map above. The Brussels-Calais train covers 135 miles daily, the Ostend-Cologne, 215 miles; the North Star, 335 miles; the Cote d’Azur, 689 miles; the Golden Arrow, 184 miles; the Edelweiss, 559 miles; the Milan-Cannes, 231 miles; the King Carol I, 142 miles; and the Bucharest-Galatz, 163 miles. In Germany the Wagons-Lits Company does not hold the monopoly, as during the war of 1914-18 a German Company, the “Mitropa”, was constituted for the purpose. In Switzerland also a small company operates certain national services. In both these countries, however, many international services are run by the International Sleeping Car Company. The Russian services came to an end with the advent to power of the present government, and the entire rolling-stock of the company, consisting of over 300 specially built sleeping and dining cars, changed hands. For the maintenance of its rolling-stock the International Sleeping Car Company owns a number of repair shops. The first of these was built in 1881 near Paris, and others soon followed in Austria, Italy, and other countries. In 1898 a large shop was erected near Ostend, where also heavy repairs could be executed. At the same time there appeared an innovation in the shape of a large laundry establishment. It adjoined the repair shop, which had a capacity for sixteen coaches. A great step forward was made by the construction of the repair shop at Zossen, near Berlin, in 1907. Electric traversers were used here for the first time, and this convenient system has since been adopted in all other repair shops of the company. Zossen had a capacity for thirty-five cars. A year later another large shop was erected at Vienna, and in 1909 the construction of a new shop at St. Denis (near Paris) was taken in hand. This has accommodation for forty-two coaches under cover and for thirty-eight on sidings. This capacity was increased later on by the addition of a new wing for fifty-eight coaches under cover. The shops at Milan and Rome each have a capacity of twenty coaches. To the above repair shops must be added those at Budapest, Irun, Bucharest, Prague, Warsaw, Algiers, and Harbin; the accommodation is twenty, nine, seven, five, four, two, and two coaches respectively. The great extension of the French services has necessitated the erection of another shop at Villeneuve, near Paris, where a building 820 ft long, with eight inspection pits, has been erected. A second building contains seven electric hoists and all the requisite machine tools for heavy repairs and overhauls. A third building contains a mechanical laundry capable of dealing with seventy thousand pieces of laundry per day. THE “STAR OF EGYPT EXPRESS”, which runs daily in winter on the route Cairo-Luxor-Assuan-Shellal, a distance of 554 miles. The first sleeping cars, built in 1872, were four-wheeled vehicles, with a length over buffers of 29 ft 6 in. The wheelbase was 15 ft 1 in. These cars had a centre corridor and a transverse passage leading to the door, which was placed about the middle of the car. The coaches contained three compartments, each with four armchairs, and two lavatories. For the night two of the armchairs in each compartment were pushed towards one other, the backs were lowered to a horizontal position, and the lower berths were ready. The upper berths were kept during the day attached to the ceiling by leather straps and they were lowered for the night. The carriages were illuminated with colza oil or petroleum lamps. During 1873-74 longer carriages were built, containing fourteen or sixteen berths arranged in compartments of two or four berths each. During this period several six-wheeled coaches were built, and the wheelbase was increased to 31 ft 2 in. The interior was altered, the armchairs being abolished in favour of sofas. The back of the sofa, when raised ninety degrees, formed the upper berth. The sofa was constructed to contain mattresses, pillows, and bed-linen, which were made easily accessible by tilting the sofa seat forty-five degrees. Other improvements included gas lighting and heating by low-pressure hot-water radiators. In 1878 the decision to run complete trains led to the construction of carriages having open platforms at either end to allow the passage from one car to the other. A new type of sofa was introduced, in which the seat turned upside down so that the underside, constructed as a mattress, formed the bed. This obviated the necessity of providing an extra mattress required by the previous type of sofa. To improve the running of the cars the suspension of the springs of the carriages had a length of 7 ft 4½ in. In the meantime, dining cars had been put in service. Their potentialities had originally been tested with a number of third-class coaches lent by the Anhalt Railway Company on its line between Berlin and Frankfurt. By the time the “Orient Express” was ready for its first journey the company had constructed a new dining-car consisting of two compartments and a kitchen. The dining compartments had four tables for four and four tables for two persons. In 1883 bogie coaches were introduced. This type of coach was already in use in USA and on the British railways, but was then unknown on the Continent. It is difficult at this distance in time to realize the obstacles the company had to overcome to obtain the consent of the Continental railways to allow bogie cars over their lines. After many searching experiments on the Berlin-Frankfurt line and on the lines of the Eastern Railway of France, permission was given to use bogie cars for the new “Orient Express”, which was to connect Paris with Constantinople (Istanbul). Before this, bogie cars of the company had been running on certain lines. They were the first on the Continent, a fact that remains a tribute to the progressive spirit that has always pervaded those responsible for the management of the International Sleeping Car Company. With the introduction of the bogie cars the construction of tour- and six-wheeled types was abandoned. A SLEEPING CAR OF 1884. Sleeping cars of this period afforded accommodation for twenty people, were gas-lit, and weighed about 27 tons. The first continental sleeping car was constructed in 1872. It was a four-wheeled vehicle, and was lit by colza oil. It weighed only 13½ tons. The new bogie sleeping cars were built in two types, first class only, and composite first and second class. The open platform was abolished and vestibule connexions substituted. The length of the cars was increased, and the distance between bogie centres brought to 36 ft 9 in. The introduction of the continuous brake system on many Continental lines made it necessary to provide the company’s cars with the requisite fittings, and the weight of the sleeping cars increased to 26 and 27 tons. SIMPLICITY OF DESIGN is an outstanding feature of the modern sleeping car. The corridor shown above is steam-heated, as can be observed from the pipes on the left. It will also be noted that the doors to compartments have hinges, and are not sliding, as is a common practice on trains. In 1889 the company built two sets of Club Trains for the London-Paris service. The English train was composed of three saloons, a composite brake van, halt of which was arranged as a smoking-room, and one four-wheeled luggage van. The French tram contained, in addition, the dining car and a four-wheeled vehicle containing the kitchen. The trains. were lighted by electricity, current being supplied by a battery of accumulators. In 1890 several of new types of sleeping cars were built to suit the requirements of different countries. Among the new types was the sleeping car built for the “Gothard Express”, which contained two compartments of four berths and four compartments of two berths, the latter being equipped with a wash-stand enclosed in a cupboard. To meet the wishes of British passengers the weekly “P & O Express” was inaugurated in 1892 between Calais and Brindisi. From Brindisi the famous P & O express steamers Isis and Osiris conveyed the mail and passengers to Port Said, where they were taken on board the P & O mail boat to India. In the same year the company built a special saloon coach for the use of Royalty and official personages. This coach contained a large sitting-room, two large bedrooms, each with an adjoining toilet, and three compartments for the suite. 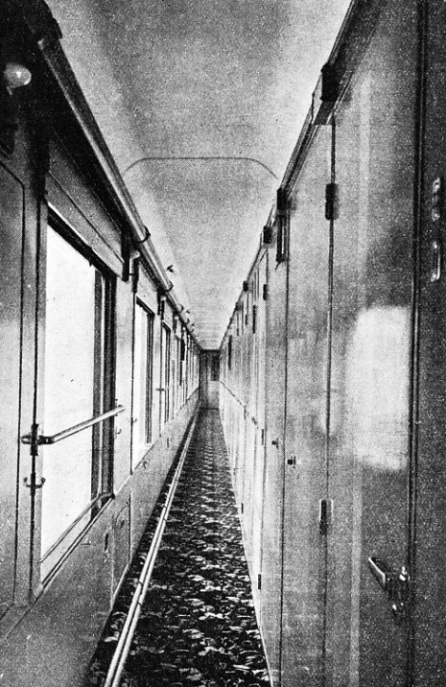 The introduction in 1894 of the “Ostend-Vienna Express” and of the “Nord Express” was characterized by an entirely novel interior arrangement of the sleeping cars. The coaches built for these trains had a length overall of 63 ft 6½ in; the distance between bogie centres was 41 ft, and the weight 34½ tons. The Ostend-Vienna cars had two compartments of two berths, with an intermediate toilet compartment, three other two-berths compartments, one of three berths, and one of four berths. The “Nord Express” cars contained six compartments of two berths each; a toilet was installed between every two compartments. There were, in addition, two compartments with four and with two berths respectively. The dining car of either train had the same dimensions as the sleeping cars, and seated forty-two persons. duced; in this system the current-producing dynamo is driven by one of the axles. The new dining cars built in this year had a length of 60 ft 8 in. Three years later the company put in service on the Paris-Orleans line, eight-wheeled sleeping and dining cars 76 ft 11 in long. These were at the time the longest cars in use anywhere on the Continent. The underframe was all-metal and the distance between bogie centres was 52 ft 6 in; the weight of the cars was 52¾ tons. IN COACH NUMBER 2419 the Armistice which concluded the war of 1914-18 was signed. It is now preserved by the French at Rethondes. near Compiegne. After the war, which seriously interfered with the activities of the International Sleeping Car Company, the whole system was reorganized. From this date until 1922 the type of carriages remained practically unaltered, though continuous improvements were made in the interior arrangements and equipment, and the decoration of the cars become more and more elaborate. In. 1922 the company, always ready to adopt new methods and keep pace with the progress of railway engineering, began the con-struction of all-metal coaches. The first coaches of this type were built in England by the Leeds Forge Company (now a subsidiary of Metropolitan-Cammell Carriage Wagon and Finance Company, Ltd, of Birmingham). The carriages were sent to the Continent by the Harwich-Zebrugge ferry-boat service. Since then all new rolling-stock of the company has been of all-metal construction. The following standard measurements have been adopted: overall length 76 ft 11 in, distance between bogie centres 52 ft 6 in, distance between wheel centres 8 ft 2½ in. The internal arrangements vary according to the services on which the cars are employed. AN ALL-METAL MODERN COACH built for the company. Standard measurements have been adopted for the construction of the cars. The overall length is 76 ft 11 in; the distance between bogie centres is 52 ft 6 in, and the distance between wheel centres 8 ft 2½ in. The interior arrangements vary according to the service in which the cars are employed. Some of the cars have eleven compartments with two berths each; the partition between two compartments is diagonal, and the wash-stands are placed in the receding parts, thus leaving the floor space free. There are doors between each of two adjoining compartments, which told back so that practically one large compartment can be formed. Other cars contain eight single-berth and four two-berth compartments. The “Calais-Mediterranee Express” contains ten single-berth luxury compartments. The dining cars are now generally built to seat fifty-six. During the last few years the company has introduced buffet cars for short journeys, with light refreshment bars. 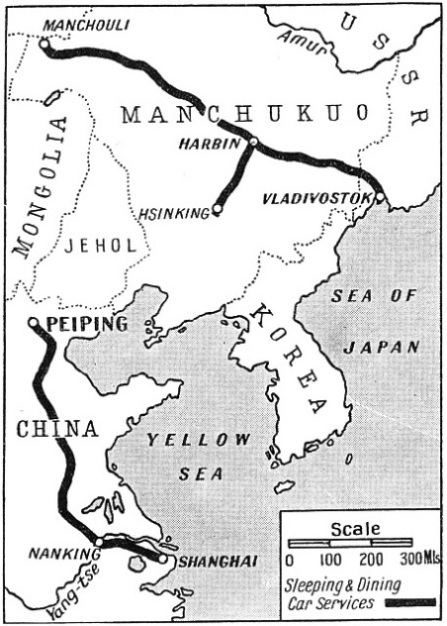 THE “MANCHURIAN EXPRESS”, running from Harbin to Chang Choun, a distance of 147 miles, on the Chinese Eastern Railway, was inaugurated in 1906, and operated with coaches of the International Sleeping Car Company. By 1914 the Company had thirty-two luxury trains in service, covering a mileage of 35,003. Trains composed of Pullman cars were run for the first time on the Continent between Milan and Cannes in 1925. In the following year the famous “Golden Arrow” service between London and Paris was inaugurated. A description of the “Golden Arrow” appears in the chapter beginning on page 232. The table on page 1158 gives details of the principal types of sleeping and dining cars built by the company since its inauguration. Besides the rolling-stock for standard gauge railways, the company has built special cars for the Russian railways, which have a gauge of 5 ft, and for Spain, where the gauge is 5 ft 6 in. This width makes it possible to provide comfortable seats also in the corridors. For service on narrow-gauge lines, such as the Montreux-Bernese Oberland (3 ft 3⅜ in), the Sardinian lines (3 ft 1⅜ in), and the African lines (3 ft 6 in) separate cars have been built. 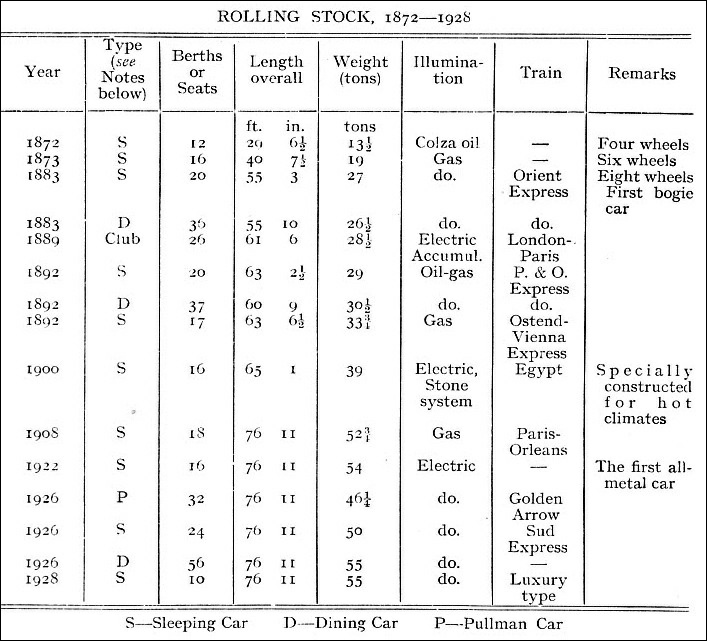 The general economic conditions prevailing in most of the Continental countries since the war necessitated the introduction of second-class sleeping cars on a larger scale than before. At first the sleeping cars with four- and two-berths compartments were used by reserving the two-berths compartments for first-class and the others for the second-class passengers. Other cars of older types were completely transformed, and later, when the all-metal cars were built, the company built separate first- and second-class cars. In recent years, in some countries, provision has been made also for third-class passengers by suitably modifying some of the coaches. Besides the luxury trains and the many sleeping and dining-car services, the company runs a number of Pullman trains and Pullman cars on comparatively short runs. As the services of the company extend to nearly all European countries and also to Asia and Africa, certain constructional details have had to be altered to suit the particular climatic conditions. Thus, for example, each of the Egyptian coaches is built with a double roof, the inner roof being of cork and asbestos sheets. The space between the inner and the outer roofs creates a closed-in air cushion, which in itself is a good insulating medium. The walls of the cars are similarly constructed. Fixed shutters set into the upper part of the windows protect the travellers from the scorching sun, and a refrigerator plant drives cooled air into the carriages. Similar arrangements are made on the Algerian and the Congo lines. FAR EASTERN ROUTES over which the International Sleeping Car Company’s services are in regular operation can be seen on this map. The total rolling-stock of the company at the end of 1934 consisted of 1,134 sleeping cars, 714 dining cars, 19 saloon coaches, 167 Pullman cars, and 157 brake vans. Particular mention should be made of the dining car services. In no other branch is the international character of the company so well revealed. Meals of several courses are served at stated hours and at fixed prices. At other times dishes may be ordered from the tariff. As a rule the dining car may be used by all classes of passenger without distinction; but this concession does not apply to Pullman services. The dining cars carry a large stock of wines and spirits. On the international trains special arrangements are made to meet the requirements of the customs authorities of the various countries through which the car is passing. Wines and spirits, as well as tobacco, are kept in separate cupboards, one for each country. When the car passes, say, from France into Italy, the Italian customs officers seal the French cupboard and remove the seal from the Italian cupboard. On leaving Italy for Yugoslavia. the Yugoslav customs officers seal the Italian cupboard, and remove the seal from the Yugoslav cupboard, and so forth. This arrangement does not prevent foreign wines from being served in any of the countries traversed. But the French champagne ordered during dinner in Austria comes from the Austrian depot at Vienna and the Austrian duty has been paid on it, in the same way as the Chianti ordered for dinner somewhere in Poland has been supplied by the depot in Warsaw, which has paid the duty on it. The quantity of wines and spirits which the company keeps in its various depots and cars is of necessity large. In the company’s annual report for 1934 this item amounted to £130,000. 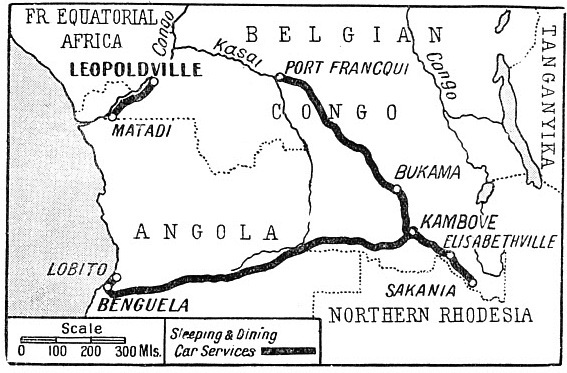 PORTUGUESE WEST AFRICA (Angola) and the Belgian Congo are included in the extensive territory where the traveller’s needs have been provided for by the International Sleeping Car Company. The international travelling public met in the dining cars is generally exacting in its demands, and every through dining car has to carry a large- and varied stock in each of the “national” cupboards. There is no official record of the special dinner parties given in the company’s cars, and of the bottles of champagne consumed at some of these parties. It is necessary to listen to the stories that the head waiter of the dining car will tell to a passenger who has often travelled in “his” car, and is able to have a quiet chat with him in that mysterious compartment at one end of the car which is both his office and his berth. A word should be said about the sleeping and dining car attendants. It is no exaggeration to say that the popularity of the International Sleeping Car Company is partly due to its travelling officials in their smart brown uniforms (the dining car waiters wear immaculate white jackets). These attendants are everywhere, hear everything, and see everything. They are silent and discreet; nothing surprises, nothing excites or perturbs them. They are there to make the passengers comfort-able; they will call them at any time of the night; and they will take charge of passports and assist at the customs examinations when the train passes the frontiers at night. Being excellent linguists, they will act as interpreters at any station. They send off telegrams, and are ready to help in any way. Their task is not an easy one, and requires infinite tact. They deal daily with a large number of passengers belonging to all nations of the world, where each has his own peculiarities and requirements, expressed in many different languages. The passengers may consist of Royalties and crooks, artists and millionaires, diplomats and spies, scientists and generals, old ladies and film stars, infants in arms and death-defying octogenarians, thrown together within the narrow space of a railway carriage. To deal daily with such a kaleidoscopic multitude demands iron nerves, endless tact and an eternally good humour. SERVICES OUTSIDE EUROPE were begun by the Sleeping Car Company in 1901. In that year a luxury train on the Alexandria-Cairo-Luxor route was inaugurated. This map shows the present-day routes on which the company has interests in the Near East. The activities of the International Sleeping Car Company are not confined to the running of luxury trains and other services. It maintains a chain of tourist offices in all countries where its services are running. Their number amounts to 198, to which 421 official agencies must be added. Since the amalgamation with Thos. Cook & Son, Ltd, a few years ago, all British and foreign offices of Cook’s form part of this vast organization. The headquarters of the company are in Paris, although the registered offices of the company are in Brussels. The divisional headquarters (in alphabetical order) of the company are at Aleppo (Syria), Algiers (French North Africa), Amsterdam (Holland), Athens (Greece), Basle (Switzerland), Belgrade (Yugo-slavia), Berlin (Germany), Brussels (Belgium), Bucharest (Romania), Budapest (Hungary), Cairo (Egypt), Copenhagen (Denmark), Elisabethville (Belgian Congo), Harbin (Manchukuo), Helsinki (Finland), Istanbul (Turkey), Kaunas (Lithuania), Lobito (Portuguese West Africa), Madrid (Spain), Paris (France), Prague (Czechoslovakia), Riga (Latvia), Rome (Italy), Sofia (Bulgaria), Talinn (Estonia), Vienna (Austria), and Warsaw (Poland). The International Sleeping Car Company is entrusted with the transport of mails by its trains. A special parcel express service by these trains has been organized by the company. The cost of transport is naturally high, but the cost is amply counterbalanced by the quick delivery. Thus, for instance, a 22 lb parcel from Paris to Warsaw costs eleven shillings, and a case weighing 2 cwt from Paris to Bucharest about £9 14s 0d. But it must be borne in mind that a parcel from Paris to Warsaw by the “Nord Express” reaches Warsaw in twenty-two and a half hours, whereas a parcel sent by post would probably be ten days on the way. Further, the 2 cwt case from Paris to Bucharest would probably take a fortnight if sent by ordinary express, whereas the “Orient Express” delivers it in about forty-three hours. The company does not own any locomotives. Its express trains are hauled by the engines of the different countries through which the express trains travel. As speed is of the utmost importance for the service of the company, its trains are generally hauled by the most powerful engines available in each country. This is, of course, also necessary because of the weights of the luxury trains, which vary according to their composition. Thus, for example, the “Orient Express”, made up of three sleeping-cars, one dining car, and two vans, weighs 292¼ tons; the “Simplon-Orient Express” leaves Paris with five sleeping cars, one dining car, and two vans, and weighs 400 tons; the “Calais-Mediterranee Express” consists of six sleeping cars, one dining car and two vans, representing a weight of 454½ tons. 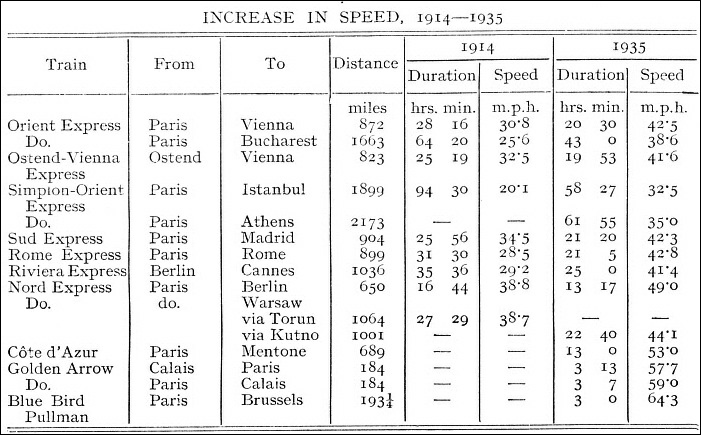 It is interesting to compare the speeds of the principal luxury trains in 1914 with those at the present time, as shown in the table on page 1152. Some of these speeds do not appear at first sight to be out of the ordinary. But it must be borne in mind that the time of transit indicated includes all stops, which are numerous and often long, particularly at frontier stations. 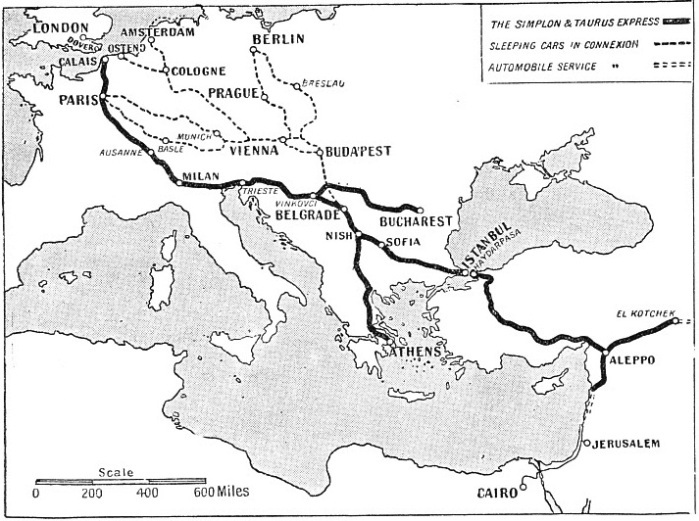 The “Simplon-Orient Express”, for example, stops on its way to Istanbul at thirty-nine intermediate stations and crosses the French-Swiss, the Swiss-Italian, the Italo-Yugoslav, the Yugoslav-Bulgarian, and finally the Bulgaro-Turkish frontiers. The total time taken up by all these stops is seven hours less two minutes, almost one-eighth of the duration of the journey. The “Riviera Express” is another example. On the short stretch of fifty-one miles from San Remo to Cannes the train stops at eleven intermediate stations, taking two hours forty-seven minutes. On the other hand, we find that the same “ Riviera Express ” covers the distance from Erfurt to Frankfurt (177 miles) in 183 minutes, at a speed of fifty-eight miles an hour. Similar speeds are obtained also on other lines where the train has a free run in level country and over long distances without intermediate stops. The speed of the “Blue Bird Pullman” is exceptionally good. The services outside Europe require a few words of explanation. They may be conveniently placed in five groups - North Africa, Belgian Congo and Angola (Portuguese West Africa), Egypt, the Near East, and the Far East. The grouping is shown in the accompanying table. 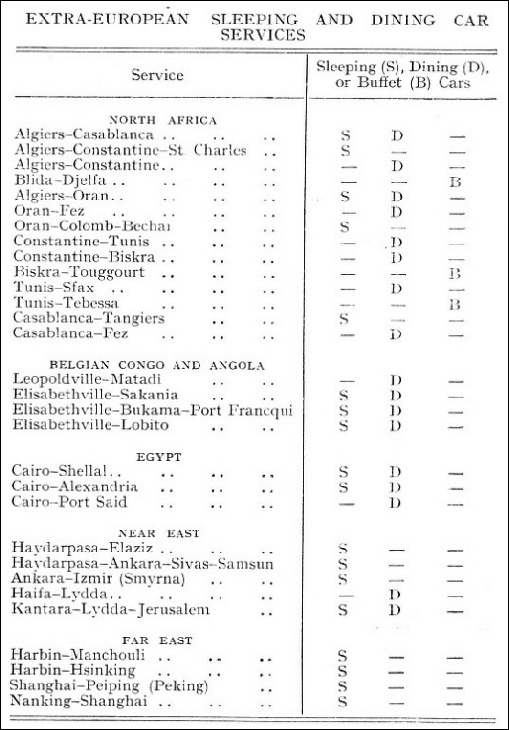 As explained in the chapter beginning on page 717, the railways of Northern Africa serve Morocco, Algeria, and Tunisia. There are two main railway systems in Morocco - the Tangier-Fez Railway and the Moroccan Railways Company. In Algeria, the Algerian State Railways and the PLM (Algerian) are now working in such close co-operation that the system is virtually unified as the Algerian Railways. The Tunisian Railways belong to the Government, but they are leased to the Tunisian Railway Company, whose headquarters are in Paris. As will be seen from the table, the vehicles of the International Sleeping Car Company operate on most of the lines in Morocco, Algeria, and Tunisia. Farther south, the lines associated with the International Sleeping Car Company are the Benguela Railway and the railways of the Belgian Congo. [These are described in the chapter, “Across Africa by Rail”, beginning on page 1133. The Benguela Railway runs for 837 miles across Angola (Portuguese West Africa) from Lobito Bay to the frontier of Belgian Congo, the first station in Belgian territory being Dilolo. The connecting Belgian line is known as the Leopoldville-Katanga-Dilolo Railway. The Egyptian services, and those in the Far East, need no special explanation. 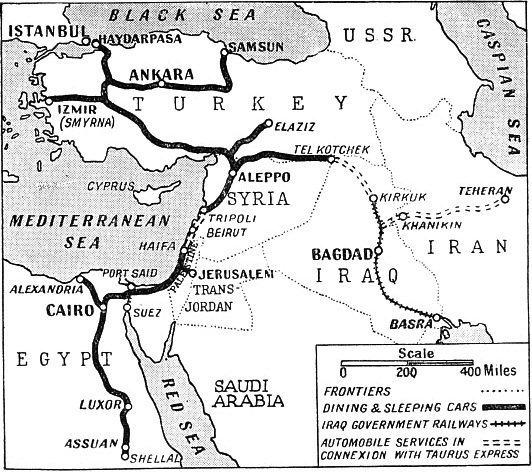 In the Near East the sleeping car services are mainly those of the “Taurus Express”, which runs through Turkey-in-Asia into Syria, and connects, by means of motor services, with Iraq. In Palestine the company’s dining cars run on trains between Haifa and Lydda, junction for Jerusalem. Dining and sleeping cars are found on the trains from Kantara (East), on the Suez Canal, to Lydda and Jerusalem. It is difficult to value to its full extent the services which the International Sleeping Car Company has rendered and is rendering to the progress of civilization and culture. Nothing brings the nations of the world nearer to one another than travel, and nothing broadens the mind as much as direct acquaintance with other countries. The cultural mission of the company is in itself a matter which deserves the fullest acknowledgement. Those interested in railway matters will especially appreciate its eminent services. You can read more on “Modern Passenger Rolling Stock”, “The North American Railway Carriage” and “The Railway Carriage” on this website.